Anyone who loves to get their exercise though outdoor activities knows quite well just how hard the winter months can be to stay in shape. Whether it’s the shorter days, the holidays or something else, we struggle to find the time and energy in our already busy days to workout. Some may take refuge at their local gym, while others try to stay motivated with their own home exercise equipment. Regardless of how you maintain your fitness level, the important thing is that you do. Here are a few tips to help keep you fit through the winter. The first place to start is by developing a workout that will fit your schedule and your fitness needs. 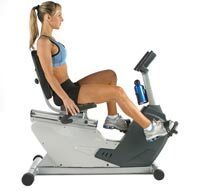 Focus on using gym equipment to incorporate both strength training and cardiovascular fitness. This will mostly likely entail the use of a weight machine and some variation of an aerobic activity (ie. exercise bike, treadmill, elliptical). If you do not enjoy lifting weights or utilizing stationary equipment, you will need to find an alternative. Many people find classes to help keep them going. Programs like Cross Fit are becoming very popular for this reason. Cross Fit is notorious for working all the major areas of fitness in one short, intense class that can also offer great comradery as a social event that also helps keep you motivated. The winter can be a long few months when you are struggling to motivate every other day for a routine workout. Staying positive is critical to your success with staying in shape. A positive attitude will help the time during your workout go by much faster and leave you feeling renewed. Just because old man winter is hanging around does not mean you can not get outside and enjoy the weather. Cross country skiing, snow shoeing, alpine skiing and snowboarding are terrific ways to stay in shape while having fun during the winter months. If you are new to any of these sports consider a lesson as it will give you the knowledge to be able to enjoy the sport that much more. Hopefully these tips will help you maintain your physical fitness throughout the winter months and bring you eager and motivated for the coming spring! Thanks for this article. This will help me for my exercise this winter.